Bus from Kuala Lumpur to Temerloh is the simple and convenient way to travel to Temerloh, the second largest city in Pahang. Many locals prefer to take express bus service because bus service is the only direct form of public transport to travel from Kuala Lumpur to Temerloh. There is no direct flight and train service available for this route. Besides local people in Temerloh, residents from Mentakap, Kuala Krau, Jerantut also use this service to get from Kuala Lumpur to Temerloh. Upon arrival at Temerloh Bus Station, many of them will transfer to the city bus to go to Mentakap, Kuala Krau and Jerantut. Transnasional and LA Holidays are the two popular bus operators that offer bus from Kuala Lumpur to Temerloh. Transnasional is one of the leading express bus operators in Malaysia. Transnasional is the well-known brand as well as many Malaysians' favourite national bus operator because of their excellent service, punctuality, and frequent daily bus schedules. Meanwhile, LA Holidays is a new and growing express bus brand in Malaysia. LA Holidays is gaining popularity among passengers for its exceptional bus service quality especially in Pahang. 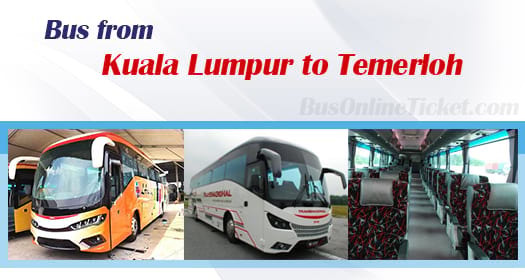 Bus from Kuala Lumpur to Temerloh provided by Transnasional has 4 daily departures. The earliest departure goes in the morning 8:00am and the latest departure is in the evening 8:00pm. On the other hand, LA Holidays Express has 8 daily departures. First bus starts at 10:00am and the last bus is at 8:00pm. Bus from Kuala Lumpur to Temerloh takes on average 2 hours depending on the road traffic condition on the departure day itself. For short-distance bus journey, washroom break will be given upon request to the bus driver during the journey. The bus fare is charged at a standard price of RM 12.00. Transnasional provides bus from Kuala Lumpur to Temerloh will pick up passengers at Pekeliling Bus Terminal. You can get to Pekeliling Bus Terminal by taking taxi, intercity bus, or LRT. The nearest LRT station is Titiwangsa Station. LA Holidays will pick up passengers from Terminal Bersepadu Selatan, also known as TBS. Apart from taxi, you can easily access to Terminal Bersepadu Selatan by KTM, LRT and intercity bus. Upon reaching Temerloh, both buses will drop off passengers at Temerloh Bus Terminal. BusOnlineTicket.com offers convenient and easy online booking experience. Passengers could save the hassle from travelling to the ticketing counter just to buy a ticket. You can book your bus ticket from BusOnlineTicket.com or via mobile app which can be downloaded for free on App Store or Google Play. You will get instant booking confirmation email upon a successful payment.